Nowadays, for most families, going out to dinner is a decision based on how much money is in the budget. 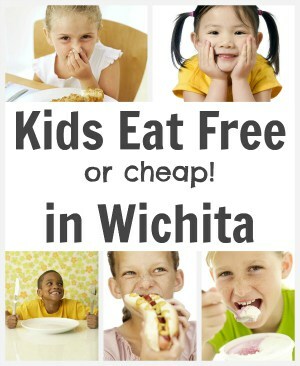 Wouldn’t you love a convenient list compiled of local Wichita kids eat free (or cheap) deals? We tracked down some of the most budget-friendly and kid-friendly restaurants in Wichita, KS here in this list. Keep it handy; your children – and your wallet – will thank you! Remember, even though we’ve checked every deal on this list, it’s always a good idea to call and confirm any kids eat free Wichita deals before heading out, because kids’ meal deals are subject to change. Be sure to scroll to the bottom to see the list of restaurants where kids eat free/cheap Every Day. Applebees Kids Eat Free All Wichita locations, as well as Derby, Andover, and Park City, offer a cheap kid’s meal deal all day on Tuesdays & Thursdays. It’s either a 99-cent or $1.99 kid’s meal with purchase of an adult meal, depending on which menu item you order. Dine-in only. IHOP FREE kid’s meal with purchase of adult meal from 4 p.m. to 10 p.m. on Tuesdays and Wednesdays. Deal for ages 12 and younger only. At participating venues including, 3505 N. Rock Road, and 11855 E. Kellogg Drive, Wichita. For deals at more locations, see the “Kids Eat Free Every Day section at the bottom. IHOP FREE kid’s meal with purchase of adult meal from 4 p.m. to 10 p.m. on Tuesdays and Wednesdays. Deal for ages 12 and younger. 3505 N. Rock Road, and 11855 E. Kellogg Drive, Wichita. For deals at more locations, see the Kids Eat Free Every Day section at the bottom. Dickey’s Barbecue Pit FREE kid’s meal per paid adult meal of equal or greater value. Dine-in only; all day Sunday. For kids age 12 and younger. Not valid with other offers or promotions. At their Maize Road location, Dickey’s has FREE ice cream every day! 2768 N. Maize Road and 2244 N. Greenwich Rd. Denny’s Kids Eat Free 7 a.m. to 10 p.m. Mondays through Fridays. One FREE meal for kids ages 10 and younger with each purchase of an eligible adult entrée of at least $6. The free kid’s meal does not include a beverage. Valid at Denny’s on 4024 E. Harry St, 8030 E. Kellogg Dr, and 5700 W. Kellogg Dr.
Doc Green’s Kid’s meals are $4.95. Build your own salads are $7.55. 10096 E. 13th St., 410 N. Hillside St., and 2441 N. Maize Rd. Golden Corral (Reader Leslie just told us that the Ridge Rd. location no longer offers this deal. 🙁 It’s likely that the east location doesn’t either then…) Mondays to Thursdays starting at 4 p.m., it’s 99¢ for a kids buffet with the purchase of an adult buffet. You can get the 99¢ deal for up to 2 kids per purchase of one adult buffet. 616 S. Ridge Road Cir. and 11006 E. Kellogg Dr.
McAlister’s Deli Both locations offer $1.99 (thanks, Kara!) dine-in kid’s meals all day, every day, for kid’s 12 and under. Add a beverage for 99¢. To-go kid’s meals are $2.49. All kids menu items come with a treat! Sandwiches come with chips or applesauce. *Their Rock Rd. location has closed, they’ve moved to 2222 N. Greenwich Rd. & the West location is 7130 W. Maple St.
NuWay The Kid’s Meal Deal is offered daily from 5 p.m. to 9 p.m. for $1.49 with the purchase of an adult meal combo and includes a choice of: Kid’s NuWay, Chicken Strips, Hot Dog or Corn Dog; plus Curly Q Fries, Drink, and an Ice Cream Treat. Red Robin Unlimited side dishes like fries, broccoli, oranges, and mac & cheese are offered every day with every kid’s meal purchase. 9990 E. 13th St. Wichita, (316) 425-6300. These are deals that are no longer available, or only offered during special promotions. Buffalo Wild Wings deal is no longer going on. Cici’s kids eat free deal is only available during special promotion, but they have a good deal on kid’s meals every day. Genghis Grill’s deal is no longer being offered. Granite City won’t be offering kid’s meal deals any longer as they’ve closed their doors in Wichita. Outback Steakhouse kids eat free deals are only during special occasions, sometimes with a coupon. Sweet Willy’s BBQ is closed at this time. Jersey’s is another restaurant that has closed its doors. Sometimes Halloween kids eat free deals are abundant! Keep an eye out for them. Do you know of additional restaurants we should add to our Kids Eat FREE Wichita list? Also, which are the most fun restaurants in Wichita for kids? Leave your answers in the comments section below! PepperJax did away with their $.99 Wednesday deal. They are now half off! Thanks for letting us know, Kara! I’ve updated it above. Billy Sims has ended their promotion that kids eat free on Sundays. Aw, rats. Well thanks for letting us know, Jen! I’ve updated the listing above. Appreciate the info! I just called Golden Corral on Ridge Road and they are no longer offering 99 cent kids meals. Aww, rats. Well thank you so much for telling me! I’ll update the list. Called Red Robin on 13th St today, they said they don’t offer $1.99 kids entree. Person on phone didn’t sound sure however…. Someone should follow up to confirm. Thanks for letting us know Katie. I called this morning and confirmed that none of the Red Robin’s in Wichita are participating in this offer. Kara, thanks for letting us know! I’ll update the listing. You may want to verify this, but my son is two and I have had to pay 50 cents per year for him to eat at Tallianos, so about a buck. I have never taken him there and had him eat for free. Thank you for letting us know, Anaidy. We do verify everything before we share it, but maybe there was some miscommunication. I’m going to err on the side of caution and change it now, then we’ll double-check it with the restaurant. Thanks again! I may have overlooked this one, but McAllister’s offers kids meals for .99 if you dine in. And 2.49 for take out. We feed a family of 5 for under $30 at McAllister’s. That is such a good deal! Yes, we have McAlister’s in the “Every Day” section of the article, but it’s all the way at the bottom and there are so many restaurants in here that it’s easy to miss. Thanks for the tip! Keep seeing an ad that says kids eat free on mondays at Slim chickens (Greenwich and k-96). Thanks, Patricia! I don’t think I’ve heard of that place, but I’ll look into it! Appreciate the heads-up. Reuben’s Mexican Grill has free meals for kids on Tuesday with an adult meal purchase. LImit is 1 free kid meal with adult meal. Thank you, Sita! I will add that one! Old Chicago West has kids eat free every Tuesday after 5 pm with the purchase of an adult entree… not sure about the other locations. Oh, that’s a good one. Thanks, Rachael! Kids meals for .99 cents at Livingston’s diner 21 and Webb location. 2-8 Tuesday-Saturday. February 2018 only. Most the Middle Eastern Buffets have 5 and under free for the buffet. Some of them don’t start charging till age 7! May want to call and confirm ages for them, but the ones I have been to that are 5 and under free have been Passage to India, Kabobs, and Zaytun. Thank you for the tip! I will try calling some of them and see what I can find out! HuHot discontinued their Monday night kids eat free promotion. Hey, Mike. Thanks for letting me know. I’ll change the list accordingly. Dang, I was hoping to take advantage of the Applebees kids deal by ordering car-side, but it’s only good for dine-in. Darn. Sorry it didn’t work for carside. But thanks for letting us know. Now we can update the info so everyone will know that the deal is for dine-in only. Ciao has kids eat free Monday-Wednesday. 2 free kids meals for every adult meal. Charlie’s Pizza Taco has Kid’s Eat Free Monday-Wednesday. I love their Pizza Raft!!! Hey, Angela, thanks for the tip. I went to the website and it looks like the Kid’s Meals are still $1.99, after 4 p.m. Thanks! Carlos O’Kellys has 1/2 price kids meals on Tuesday evenings. Genghis Grill has kids eat free on Tuesday nights. Awesome, Ryan! Thanks for the tip. I never thought about checking them. Just want to clarify on here about Ihop . Not all the locations do the kids eat free like it says . It’s only the E Kellogg location that does . Thanks for the update. As I mention at the top of the post, when we put this list together all the listings were verified and checked by calling and speaking to restaurant management. But restaurants change their deals frequently. Please always call to verify first. It’s probably time for another update. It’s just so time-intensive calling all the places. I appreciate the information.